Oh, those Army daze--and nights! An infusion of WAC beauties adds to the fun when ex-G.I. "Dodo" Doubleday (William Tracy), now a hotel clerk, impresses Army brass with his memory, and considers going back into the military. 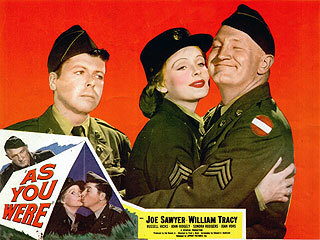 But recruiting station sergeant Bill Ames (Joe Sawyer), remembering how Tracy jinxed him back in WWII days, begs him not to re-enlist!